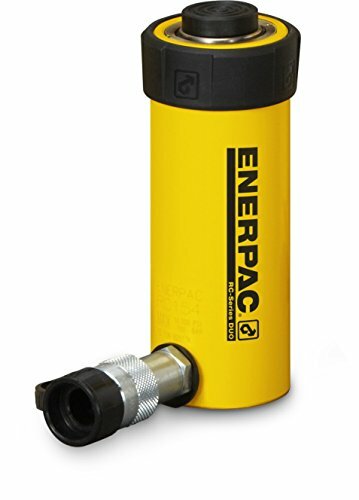 This Enerpac RC-104 single-acting alloy steel hydraulic cylinder with 10-ton capacity has a round body with one port and spring-return of the single piston rod with 4.13" stroke for use in general-purpose applications in any position. The single-acting hydraulic cylinder uses liquid pumped through its single port for rod extension and a pretensioned internal spring for expedited rod retraction to produce continued movement. A built-in stop ring prevents the plunger from extending beyond the stroke length, assists in absorbing side loads, and can endure the full capacity of the cylinder. The plunger wiper helps inhibit contamination in the cylinder, and the removable grooved plunger saddle covers the plunger mounting threads and protects the plunger during lifting operations. The GR2 bearings reduce wear and help prevent jamming and rod over-extension by absorbing eccentric load stresses. The port is a quick-connect CR-400 female coupler for use with a CH-604 male coupler (sold separately), and the included dust cap covers the port when not in use. The high-strength alloy steel body has a baked enamel finish for corrosion resistance in harsh environments.